Another wave of baking frenzy gone! 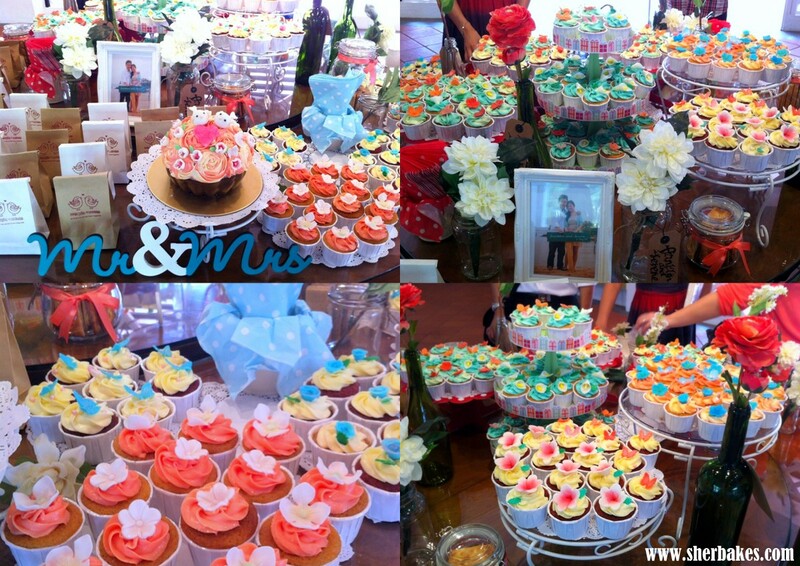 This time round it was 250 cupcakes for my cousin’s wedding reception at Botanical Gardens. To match their theme colors- coral, turquoise and ivory, I decided to go with frostings that replicate those colors. At the end of the day, I must say that the colors were so pretty!! Put them all together and it looks like a FLAG!! Frangipani. At first they looked kinda weird plain white but after petal dusting them with some red and pink, I fell in love with them! It was a factory production of cupcakes the day before. It started out shaky but once I got into the rhythm of measuring out flour, sugar, eggs, things went super-fast and soon enough I had a whole table full of cupcakes in red velvet, lemon, vanilla bean and banana! Piping the frosting, though tiring was actually done pretty quickly. The last step was to put the ready-made flowers on top of each cupcake and boy was I glad that I had a couple of helpers that day! With that I’ll shall conclude the chapter on ” Sherbakes in May”.